Moscow publishes list of U.S. citizens denied entry to Russia. The Russian authorities have published a list of U.S. citizens denied entry to Russia in response to the Magnitsky List that was announced on April 12. The Russian Foreign Ministry has published a list of U.S. citizens denied entry to Russia based on federal law "On Measures Affecting Individuals Responsible for Violating Fundamental Human Rights and Freedoms and Rights and Freedoms of Citizens of the Russian Federation." The list contains two categories of U.S. nationals. The first one includes those who, in Moscow's view, are responsible for legalizing and applying torture and holding convicts in detention for an unlimited period of time (the Guantanamo list). These people are David Addington (chief of staff to the U.S. vice president in 2005-2008), John Yoo (assistant attorney general in the Office of Legal Counsel of the U.S. Department of Justice in 2001-2003), Geoffrey Miller (commander of the Joint Task Force Guantanamo in 2002-2003) and Jeffrey Harbeson (commander of the Joint Task Force Guantanamo in 2010-2012). The second category of U.S. citizens denied entry to Russia includes those who, in Moscow's view, are responsible for violating rights and freedoms of Russian citizens abroad. These are Jed Rakoff (U.S. District judge for the Southern District of New York), Preetinder Bharara (U.S. attorney for the Southern District of New York), Michael Garcia (former U.S. attorney for the Southern District of New York), Brendan McGuire, Anjan Sahni, Christian Everdell, Jenna Dabbs, Christopher Lavigne, and Michael Rosensaft (senior officials at the Office of the U.S. Attorney for the Southern District of New York), Louis Milione and Sam Gaye (senior special agents at the U.S. Drug Enforcement Administration), Robert Zachariasiewicz and Derek Odney (special agents at the U.S. Drug Enforcement Administration), and Gregory Coleman (an FBI agent). In commenting on the publication of the Russian list, Foreign Ministry spokesman Alexander Lukashevich said the publication of the so-called Magnitsky list by the U.S. authorities dealt a severe blow to U.S.-Russian bilateral relations and that the Russian no-entry list includes American citizens responsible for legalizing torture at the Guantanamo detention facilities and for arrests and abductions of Russian citizens in third countries. "We regret to acknowledge that the U.S., following the provisions of the absurd Sergei Magnitsky Act, has publicized the names of Russian citizens on whom visa and financial sanctions have been imposed. Our principled opinion on this unfriendly step is well-known: Under the pressure of Russophobically predisposed U.S. congressmen, a severe blow has been dealt to bilateral relations and mutual confidence," Lukashevich said. "Certainly, we could not leave this unanswered and had to respond appropriately to interference in our internal affairs. The Russian Foreign Ministry website today published the names of Americans put on the no-entry list, who are denied entry to Russian territory based on the federal law 'On Measures Affecting Individuals Responsible for Violating Fundamental Human Rights and Freedoms and Rights and Freedoms of Citizens of the Russian Federation," he said. "We should note particularly that, unlike the U.S. list compiled arbitrarily, our list includes primarily those responsible for legalizing torture and unlimitedly holding convicts at the Guantanamo special prison, arresting and abducting Russian citizens in third countries, and endangering their lives and health," Lukashevich said. 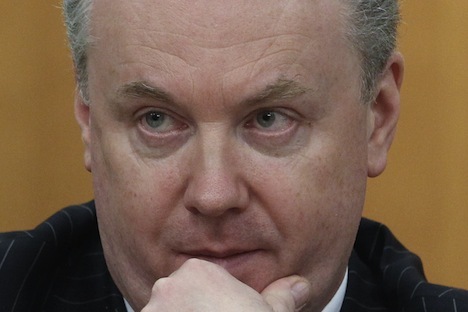 "The war of lists is not our choice, but we had no right to leave this open blackmail without response," Lukashevich said. "It is time for policymakers in Washington to finally realize that building relations with such a country as Russia in the spirit of mentorship and undisguised diktat has no prospects," he siad. According to Russian State Duma international affairs committee head Alexei Pushkov, the Magnitsky Act will be a permanent irritant in Russian-U.S. relations, similarly to what the Jackson-Vanik Amendment used to be earlier. "The Magnitsky Act and the expansion of the [sanctions] lists will be a permanent serious negative factor in our relations, which should not be underestimated. The U.S. is creating a permanent irritant in relations with Russia identical to the Jackson-Vanik Amendment," Pushkov told Interfax on Saturday. This creates a permanent anti-Russian background in the U.S., with the Magnitsky Act serving as a lever for the Congress to put pressure on the presidential administration, Pushkov said. President Barack "Obama is now a hostage to this act and a hostage to the anti-Russian majority in the Congress," he said. In commenting on the publication of a list of U.S. citizens denied entry to Russia, Pushkov described this as an appropriate answer. "We do not want to turn this into a political war, but we will act symmetrically," he said.